Squares are the rectangles that have four equal sides. Calculate perimeter of a square, area of a square and diagonal of a square. Square, in geometry, a plane figure with four equal sides and four right (90°) angles. A square is a special kind of rectangle (an equilateral one) and a special kind of parallelogram (an equilateral and equiangular one). 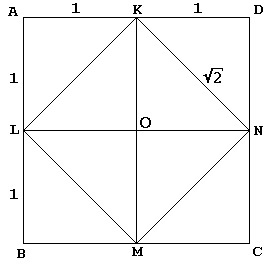 A square has four axes of symmetry, and its two finite diagonals (as with any rectangle) are equal. Bisection of a square by a diagonal results in two right triangles. If the length of the side of a square is s, then the area of the square is s2, or “s squared.” From this relation is derived the algebraic use of the term square, which denotes the product that results from multiplying any algebraic expression by itself.